The Southern Pine Inspection Bureau reported in August 2001 that "most mold...which are observed on lumber...can normally be attributed to the transportation, storage and construction stages." Keeping an Eye on Mold, Kent J. Pagel, Structural Building Components Magazine, May 2002 citing to August 2001 SPIB report. The fact that modular homes are constructed in a controlled factory environment eliminates the possibility that lumber with mold will be used in the home. Modular housing construction allows for hundreds of options and design possibilities and your builder will work with you and your home manufacturer to determine the type and design of modular home that best suits your needs. They'll generally offer a wide range of house plans to choose from in a variety of styles. They'll also offer a range of options to customize the home you select. Allowing for state building codes, you can modify or upgrade your general construction specifications, design your own floor plans and elevations, pick the style of windows or siding, choose colors of vinyl, carpet, countertops and bath fixtures. The possibilities are endless. Because modular homes are typically built in about 1/3 the time needed to construct a site-built home, with careful planning you can often be in your new home within weeks of selecting it. This is because overall building time is reduced by concurrent site work and home construction. (This also allows for reduced interest on construction financing). In addition, a manufacturer's highly skilled work force has years of experience in the building industry and works year round within the factory. This means that there are no delays from "no-show subs" as may often be the case with a site-built home. Before a modular home manufacturer begins construction, all building plans must be reviewed and approved in each state where the manufacturer intends to sell homes. Homes must be designed and built to the code for the state where the home will be shipped for final location. The manufacturers contract with state approved third party plan review agencies which conduct plan review on behalf of the state. The modular manufacturer also contracts with a third party inspection agency that is licensed by the states to perform the in-plant inspection while the home is in production. When the housing sections or modules are complete, the third party places a label on the home certifying that the home has been manufactured in conformance with the approved plans and complies with all provisions of the building code. Modular homes are built to the same building codes used by conventional site-builders. As noted above, an independent inspector will certify that the home has been manufactured in conformance with the approved plans and complies with all building code provisions for the location where the home will be erected. After construction in the factory, the modules are loaded for transport. To deal with the rigors of shipping, each modular home is constructed with roughly twenty to thirty percent more material than a traditional stick-built home (for example, drywall is typically glued with a special adhesive and then screwed to the framing). This greatly increases the structural strength of the home as noted in a recent FEMA study on 1992's Hurricane Andrew. The study concluded, "the module-to-module combination of units appears to have provided an inherently more rigid system that performed much better than conventional residential framing." Building Performance: Hurricane Andrew in Florida, FIA-22, Item 3-0180. Modular home construction is more environmentally friendly than its site-built counterpart. Engineered construction materials are utilized, and effective in-plant recycling is in place at most modular home manufacturing facilities. This means that all the excess materials are able to be recycled. This may not sound impressive, but one of the dirty secrets of site builders is the amount of waste a new site built home generates. According to the National Association of Home Builders (NAHB) Research Center, the "typical" waste for a new 2,000 square foot site built home is eight thousand (8,000) pounds or fifty (50) cubic yards. In 2000, the cost to dispose of this averaged $511 per home. Consequently, while waste from a site built home typically goes in a landfill, waste from a modular home is recycled. Cost overruns are virtually unheard of in the modular industry. As mentioned above, climate controlled factories ensure there are no weather related construction delays. In addition, there are no cost overruns from "no-show subs" (as may often be the case with a site built home). Next, because of the reduced construction time there is reduced interest on construction financing which means you, the consumer, pay less on your loans. 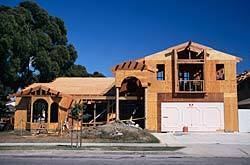 Finally, because of the volume of homes a typical manufacturer builds in a year, additional savings occurs through volume purchasing of materials and yearly buying contracts with suppliers. One of the problems today's site builders have is finding skilled subcontractors. Because modular homes are built in factories, the subcontractors are already there. Skilled craftspeople construct each home to exact specifications. In addition, the homes are built with brand name building products that you know and trust. Both in-house personnel and an independent agency inspect all homes during and after construction to ensure that every home meets our high standards and code requirements.